II LED 500 500 video from our client video from SHANGHAI MEDECO INDUSTRY CO.,LTD. II LED Touch pad control system is developed for adjustment control of power switch, brightness switch, illumination level, color temperature, color rendering index, to meet medical personnel requirement of variant operation. In comparison to conventional halogen and gas discharge lamps, the "cold" II LED light allowing for fatigue-free operating and prevents tissue from drying out in the operation field at the head area of the surgeon. The relation between light body and light field diameter guarantees an optimum illumination of the OT field in terms of area and depth. 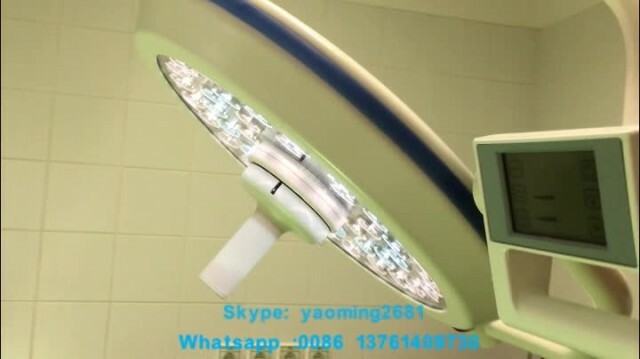 Designed to provide a light output with a color rendering index and color temperature which is very close to natural daylight.This helps the surgeon to distinguish between pathological and healthy tissue. The perfect design reduce the airflow surface beneath the ventilated ceiling, Flow- optimized light head and reduced surface temperature minimise turbulence in laminar air flow. With a life cycle of at least 50,000 operational hours, an LED provides illumination many times longer than conventional lighting.In addition,each LED can be replaced individually and on site. As a flexible lighting solution, II LED light can be individually combined with different support arm solutions,enabling it to be used as needed in different operating theatres. 04:15 MERMAID LED LIGHT TEST VIDEO SHANGHAI MEDECO INDUSTRY CO.,LTD. 01:02 II LED OPERATING LIGHT LED 700/700(Square arm) SHANGHAI MEDECO INDUSTRY CO.,LTD. 00:49 II LED OPERATING LIGHT LED 700/700(Square arm) SHANGHAI MEDECO INDUSTRY CO.,LTD. 00:53 ME OPERATING LIGHT LED700/700 SHANGHAI MEDECO INDUSTRY CO.,LTD.